While I don’t usually focus on reviews of restaurants, I do like to share special places that I’ve enjoyed during my travels. Today I’d like to make you aware of a wonderful breakfast/lunch diner I discovered while visiting Northern Nevada . 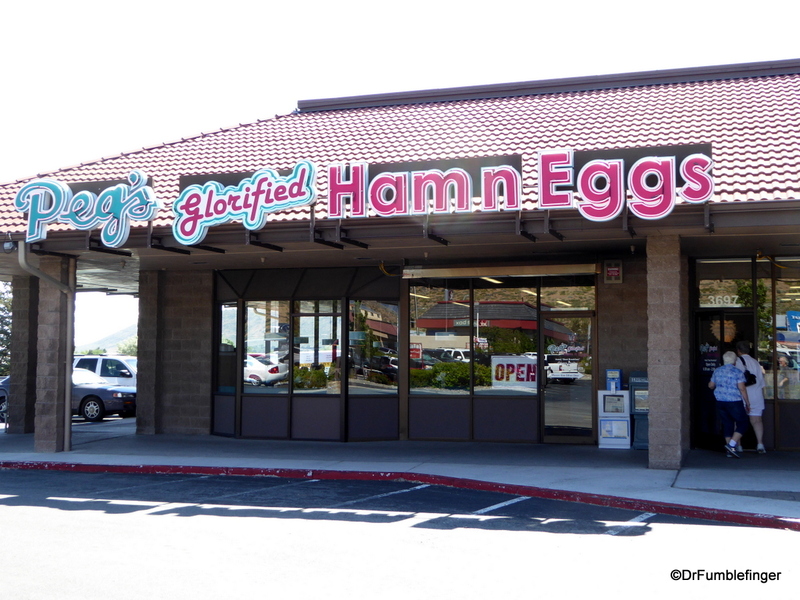 Peg’s Glorified Ham ‘n Eggs was founded in Reno in 1999 by a husband-and-wife team, Fred and Joanna (aka “Pops and Peg”). The original restaurant became so popular that there are now eight sites, including Carson City (the one we visited), Sparks and Henderson. We breakfasted at Peg’s a number of times during our week in the Reno area and tried a variety of breakfast entries. All were excellent! Peg’s is especially known for its omelets and “Glorified Skillets”. While most people go to Peg’s for breakfast, there’s also a lunch menu that includes tacos, sandwiches and salads. Daily specials are available. Portions are huge and prices reasonable, so be sure to arrive hungry. Just look at the feasts serve to you in the photos below. We enjoyed speedy and friendly service and I’m definitely looking up Peg’s when in Nevada again. Highly recommended!